We were enjoying Reykjavik quite a bit, but we also wanted to get out of the city and see what the rest of country looked like. So we signed up for a Golden Circle Tour from Your Day Tours. 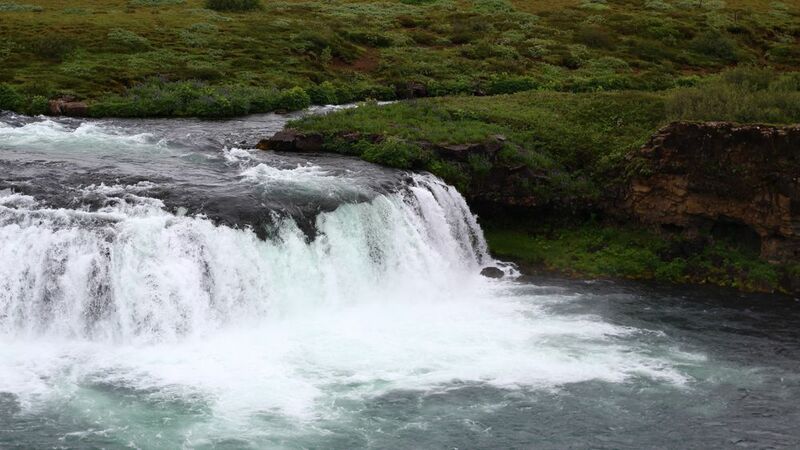 Iceland's Golden Circle consists of three locations: the Gullfoss waterfall, Geysir geothermal pools, and Þingvellir (remember, the Þ sounds like th) National Park, A UNESCO World Heritage site. Where we spent much of the day. We met the tour bus early in the morning in front of the 101 Guesthouse, a hotel in Reykjavik just off Hlemmer Square. We were among the first people on the bus, but every seat was filled by the time we'd finished driving around the city picking up the rest of our tour group. 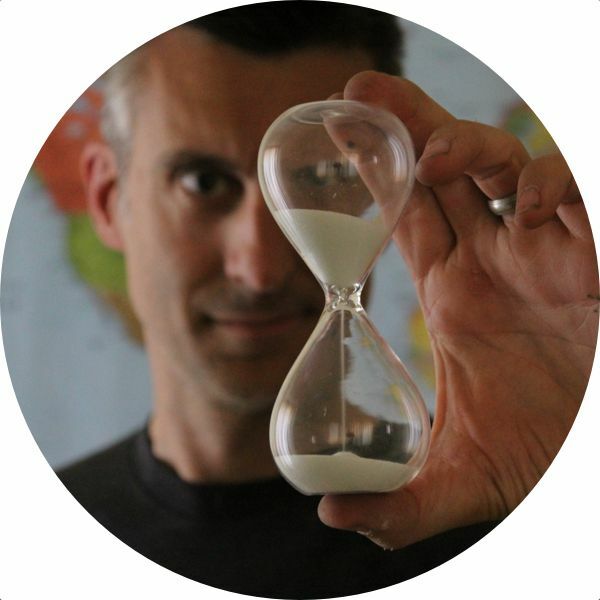 Your Day Tours was started by three brothers who figured this tourism thing might take off. Our driver and guide for the day was one of the brothers, a gent named Bothi (BoÞi). It took about an hour to drive to our first stop, and along the way, Bothi told us some facts about the country, like 80% of Icelanders believe in elves, tolls, and ghosts and that handball is the national sport of Iceland. The first stop on our tour was a relatively small waterfall (only seven meters high) called Faxi. It's a very appealing waterfall, and they day it's a good place to fish for salmon. We also took a short break here, and Bothi introduced us to smoked lamb on flat bread (called kaka, which I believe his mother makes) served with a helping of malt extract. I can't say I'd drink malt extract on a regular basis, but lamb and flat bread was quite nice. After the short break, we all piled back into the van and spent 20 minutes driving to our next destination, taking in the Icelandic landscape along the way. Iceland is very green, except for when it's dominated by fields of black volcanic rock. 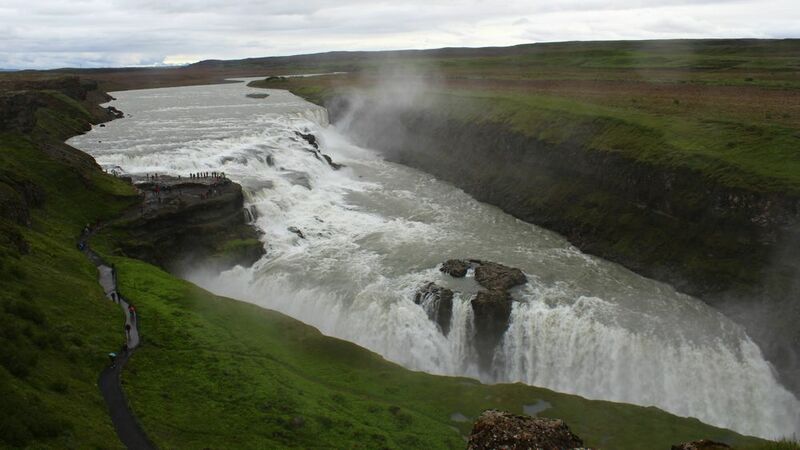 Gullfoss, which means Golden Falls, is one massive waterfall. 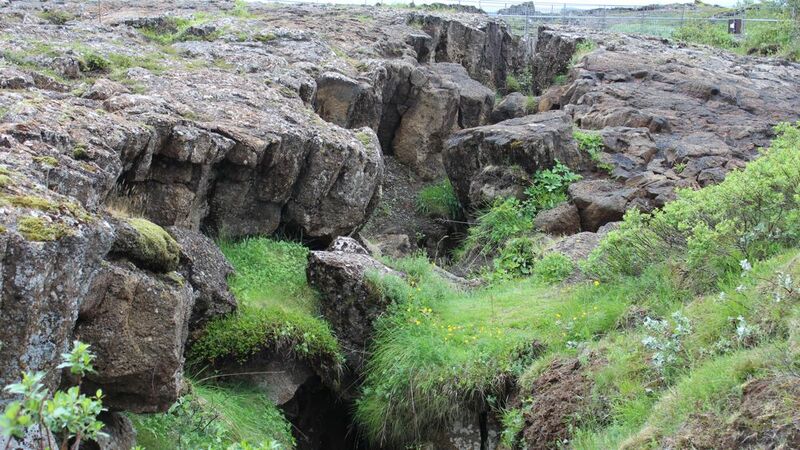 It's formed where the river Hvítá drops into a 31-meter (around 100 feet) deep crack in the Earth's surface. When looking down from on top of the hill bordering the site, the falls look very impressive. 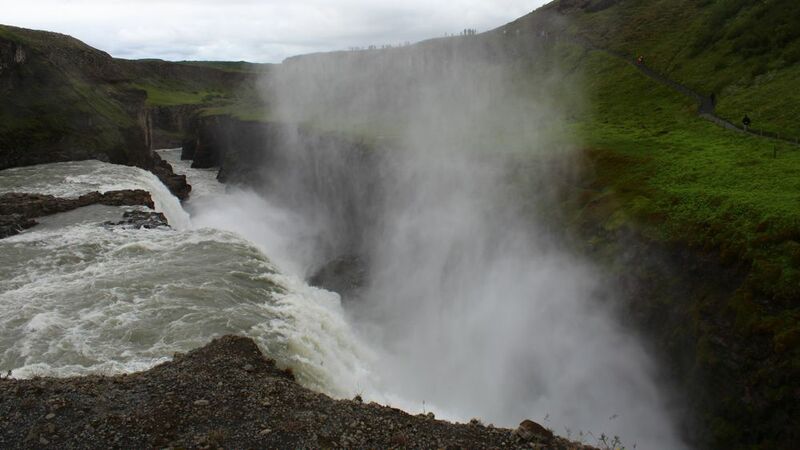 Gullfoss plunges down 31 meters. Note the people on the path for scale. We all got out of the van and walked down the hill to get up close and personal with the waters of Gullfoss. There's a lot of moisture in the air from the roaring water, and the stairs and pathways down to the falls are very wet and slippery. At the bottom of the crevice, the water moves very fast, and it's very loud. We were able to get quite close—certainly close enough to fall in, which was a bit scary. Gullfoss is a powerful piece of nature. Up close and personal with Gullfoss. 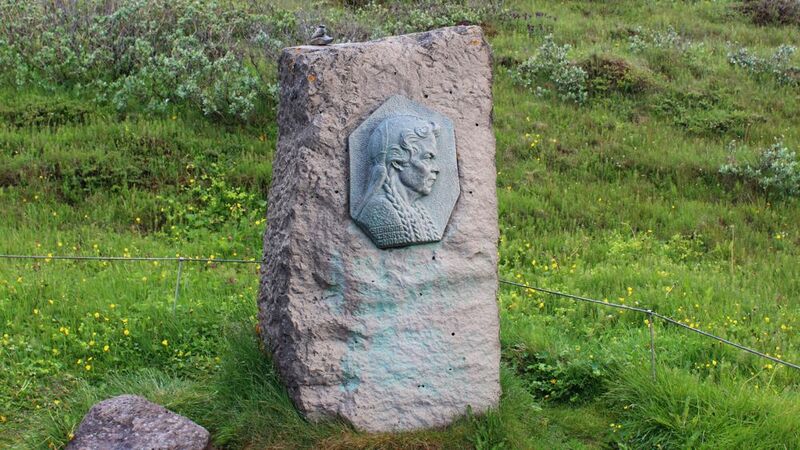 Along the path to the falls there's a monument to Sigridir Tomisdóttir, a local woman who fought to keep European industrialists from harnessing the power of Gullfoss for electrical production. As the story (which may not be completely true) goes, she fought some of the wealthiest men in the country, often walking to Reykjavik 120 kilometers away, to keep the industrialists at bay. At one point she threatened to throw herself into the falls, but ultimately, she and her lawyer won the battle and Gullfoss became the property of the Icelandic people. Haukadalur, also known as Geysir after one of the geothermal area's geysers, was only a short drive from Gullfoss. 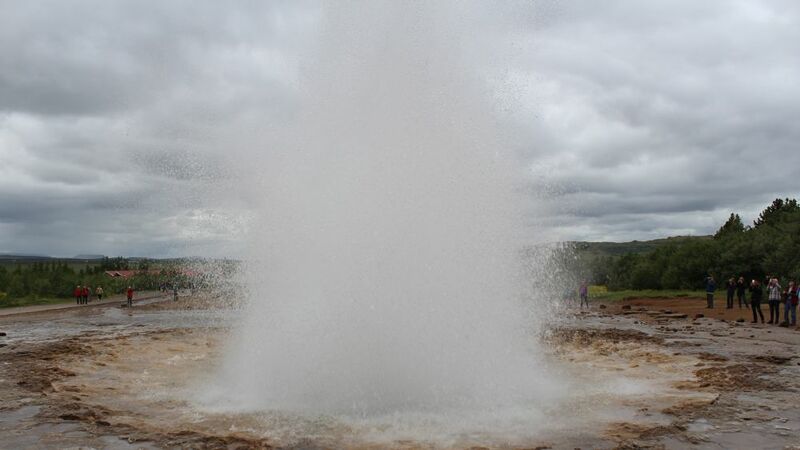 The geyser named Geysir has been dormant for many years, but there's one named Strokkur that spouts a tall spreay of hot water into the air on a regular schedule. The walk to see Strokkur spout was along a winding path filled with boiling pools and scalding steam. After watching Strokkur spout a few times, we walked back to the visitor's center and had a rather unremarkable lunch there with the rest of our tour group. It's an almost universal truth that food at tourist spots is seldom fantastic. Once we finished lunch, we boarded our bus and headed off for Þingvellir. A path through Þingvellir National Park. The drive from Haukadalur to Þingvellir was a winding affair and took about an hour. There are two main things to experience at Þingvellir. The first is seeing the North American and Eurasian tectonic plates moving apart. Now you can't actually see it (the plates drift apart only about two centimeters each year), but the entire region is filled with cracks, crevices, and canyons. The second thing to experience at Þingvellir is visiting the site of AlÞingi, the first parliamentary meeting in human history, which was first held in the year 930. This is where, each year, the chieftains of the various Icelandic tribes met to hear the Law Speaker recite the laws at Löberg (law rock) and vote on any new proposed laws. 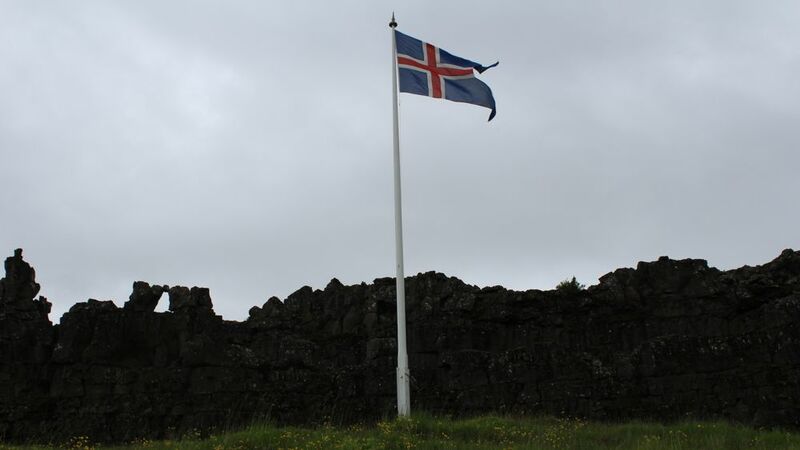 The Icelandic flag flying at Löberg (Law Rock) in Þingvellir. This is also where duels were fought along the Öxará River—after all, nothing settles a dispute quite like a duel—although these were abolished after Iceland adopted Christianity in the year 1000. A section of the Öxará River seen from Law Rock. On the drive home, Bothi regaled us with more facts and tales about Iceland. We learned how to say Batman in Icelandic (it was pretty complicated—I can't remember how to say it let alone spell it) and how to pronounce Eyjafjallajökull (the volcano that erupted in 2010, what Bothi called "the greatest PR stunt for Iceand). We also learned all about the Yule Lads—the country's 13 Santas—and their mother, Grýla, who eats misbehaving children. Plus we were told what to do if we ever find ourselves lost in an Icelandic forest—just stand up. Once we arrived back in Reykjavik, the bus dropped us off right at our apartment (which was nice), where we made a light dinner before heading off to bed. It had been a long day, and riding in a van can be oddly exhausting. The next day was sure to be relaxing, though—we were heading off to the Blue Lagoon.